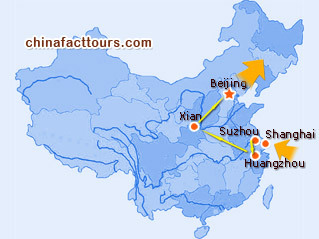 From the morden cities to the ancient capitals, from silk to tea, from the time-honored private gardens to the imperial garden, from the Great Wall to the Terracotta Warriors, the Forbidden City and the Shaanxi cave dwellings...enjoy the perfect balance of sightseeing and culture on our tours to Shanghai, Suzhou, Hangzhou, Xian and Beijing. Meet your Shanghai local guide and then transfer to the hotel. Remainder of the day is on your own arrangement. After breakfast, visit the Jade Buddha Temple. Then walk along the Bund and visit Nanjing Lu. After lunch, visit Yu Garden and Yuyuan Market. In the evening, enjoy Chinese acrobatics show. After breakfast, drive about 1.5hrs to Suzhou. Have an inner city cruise on the Grand Canal. Then visit the the Tiger Hill, the Panmen Gate and the No.1 Silk Factory. Take a rickshaw ride to visit the old town of Suzhou. You will see the unique small Hutongs (lanes), the open markets and the local people's life. Later visit the Humble Adiministrator's Garden. The rest of the day is for your free exploration. Optional activity: Night Garden Show in the Master of the Nets Garden. Transfer to Hangzhou. Visit the Pagoda of the Six Harmonies and the Hefang Street. Morning cruise on the West Lake, later visit the Lingyin Temple and the Peak that Flying from Afar. After lunch visit the Meijiawu Tea Village. Take the morning flight to Xian. Afternoon visit the Ancient City Wall and the Bell Tower. Enjoy Tang Dynasty Dinner Show in the evening. After breakfast, visit the Muslim Quarters, the Terracotta Warriors and Horses Museum. Afternoon see the Big Wild Goose Pagoda. The remainder of the day is for your free exploration. Morning half-day tour of the Han Yang Mausoleum (including a complex SpectraVision program for the tomb). Fly to Beijing and check into the hotel. The rest of the day is at leisure. After breakfast, pay a visit to the the Temple of Heaven. Proceed to visit the Tiananmen Square and the Forbidden City at p.m.. After Beijing Roast Duck dinner, enjoy the wonderful Beijing Opera. Morning make an excursion to the Mutianyu Great Wall. Afternoon visit the Dingling Tomb. Morning visit the Beijing Hutongs by rickshaws. Afternoon visit the Summer Palace (includes a boating on the lake). Free explore Beijing until you are escorted to the airport for your homebound flight. Hi rossana, thank you for your kind inquiry. Our travel consultant will contact you via email within 8 hours, please don't forget to check your email-box later.